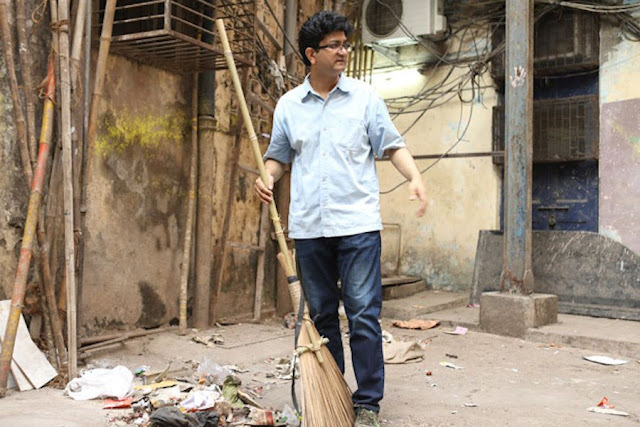 Ad Guru-Writer-Lyricist Prasoon Joshi joined Shri Narendra Modi's Swachh Bharat Abhiyan by initiating to clean the compound of Sofi Mahal Building in Lalbaug after his poetic contribution via the anthem 'Swachh Bharat Ka Irada'. The choice of venue may come as a surprise to many given that Sofi Mahal building is a two-floor double room homes to lower-middle-class families, with the compound relatively inaccessible. However, as soon as I reached the place, I knew instantly why it was perfect. Piles of garbage were lying all around the compound with not enough place to walk from one end to the other. A compound where children can easily spend their evenings playing was littered with waste, debris and rubbish. Prasoon picked the broom and cleaned the compound to enable the local children to play gully cricket. He also organized an underarm cricket tournament “Clean Sweep” to ascertain that cleanliness is maintained. In all the chaos, I found a few minutes to speak to Prasoon, who was willing to share his thoughts on the campaign. Talking about individual contributions, he emphasized that every person must contribute his/her bit and create pockets in the society which shall be an inspiration to other to follow. Along with influential personalities, even the common man needs to be responsible enough to contribute to the cause in whatever way he can. When probed about educated people throwing rubbish around instead of being change agents, Prasoon was very clear in the way they should be treated. He said such people must be condemned, looked down upon and taken to task immediately. Only when embarrassed these individuals would not commit the same crime again. Emphasising on the government’s role, he said that with a leader like Shri Narendra Modi, the campaign was sure to penetrate through the ranks and attain a reasonable success in time to come, given that we do not lose patience. With everything instant that the society is offered today, we want to see the change today. However we must ensure that we continue our fight for the Clean India campaign and work towards increasing awareness on a regular basis. Talking about his anthem, he said that he wanted children as the main singers of the anthem so that it connects with the youth today. Children today, are the future we look forward to and we need to take them along to make the campaign a success 15 years from now. Instilling a value in a child goes a long way to build a future and bring about that much-needed change. Yes, I so agree with most of Prasoon’s thoughts. And his actions bore immediate results, as the young guns of Sofi Mahal Building were all set to play their very first game of the tournament. As we were about to leave, the residents came forward to pledge their support for the campaign and committed to a clean compound for their children. As I left only one thought crossed my mind, ‘If I can influence just one person to commit to cleanliness I shall feel I’ve achieved something’. And you? How are you doing your bit?